Location: ECHA (Edmonton Clinical Health Academy) L1-140, 11405 87 Ave NW. Description: How many times have you fallen into the role where you suddenly have to manage multiple important projects? In this full-day workshop, WiSER (Women in Science, Engineering & Research) invites Julianna from JUNA Consulting to speak on Project Management. 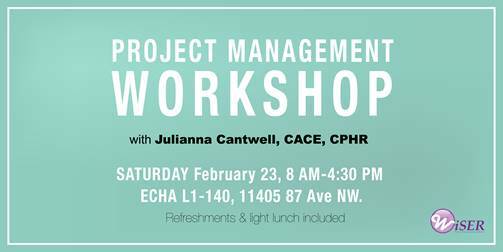 Learn about the roles and characteristics of a Project Manager, define effective leadership within a project, and understand how to effectively assess and communicate with stakeholders. This workshop is an opportunity for professionals to develop the knowledge and strategies they can apply to achieve successful outcomes when managing projects.